swonderland: notice her dress matches her light fixture? notice her dress matches her light fixture? When I was pregnant with Alice I had a kind of a pregnant-hormone-panic over the room that was going to be hers -- the only room in our house with wood paneling. I wavered back and forth over whether or not to paint the wood but ultimately decided to screw a piece of drywall to one of the walls and cover it in vintage wallpaper to distract from it paneling instead. After an extensive (and when I say extensive, I mean an obsessive ongoing nightly thing) search, I could never find the right wallpaper at the right price. In a last ditch effort to make it work, I covered the drywall in wrapping paper pieces. It looked cute. Not what I had in mind, but cute enough. And then Alice was born and lived happily with the wrapping paper wall until one morning last month when she woke up and decided that instead of calling out for me to come get her, she would stand in her crib and rip as much paper off as she could. I knew that would eventually happen. I did not think it would happen when she was 16 months old. So after much deliberation, I decided to strip the rest of the paper off, spackle it, and paint it with chalkboard paint. I think it's good. Better for a bigger girl. And she is, indeed, a bigger girl. I made broccoli cheddar soup on a whim tonight. We loved it. I wasn't surprised; it contained an entire block of cheddar cheese. 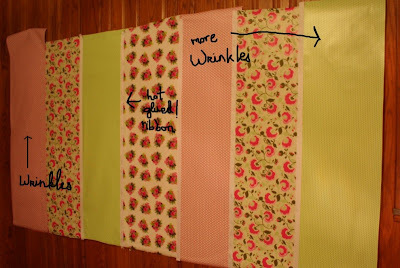 I love both stages of the wall-the wrapping paper was adorable, and I love the chalkboard too. What a fun thing for a kid to have in their room!! 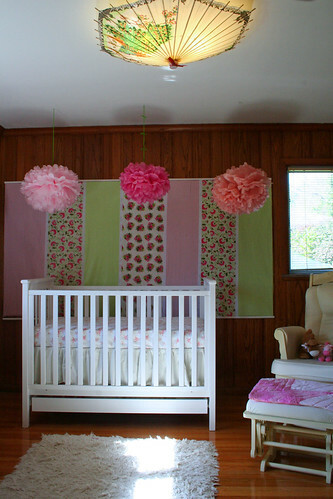 Oh my goodness, what a beautiful wrapping-papered room! You are so creative, it turned out absolutely perfect :) The chalkboard paint looks awesome too! 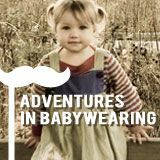 Your blog and your writing and you and your daughter remind me of all the cozy attics I wished I had when I was growing up with no attic to speak of. What a super awesome idea! I've used chalkboard and magnetic paint at different times and they're both equally awesome. The new header is lovely. The crazy lady wall and room are so very sweet. The new wall is a great idea but the best is that beautiful doll, Alice standing under it. She is just cuter than a basket of kittens. SO CUTE. all of it, but especially her. wow she is precious. and the twins have aqua and brown poofies like that in their room. love them. SOOO cute. Very creative, I do adore parsols. I love your blog, it makes me happy and chalkboadrs are ALWAYS fun. I would wear that dress, too. With or without the light fixture. But I love the light fixture, too. 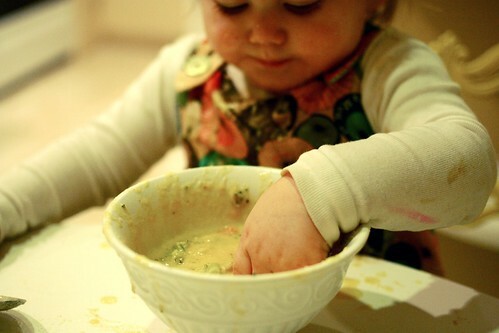 There's just a lot of adorable going on here... And I love broccoli cheddar soup. Erin, I love your posts. I have secretly always been wondering how that wall was holding up - because for a while I had it in my mind that I might try it for Eleanor's future room someday (she still doesn't have one). How wonderful, though, that you have updated it in such a creative play sort of way. I love that little dress she's got on! Where did you get it??? How in the heck do you stay so skinny eating divine looking soup like that??? And yay for broccoli cheddar soup. It sounds/looks wonderful. 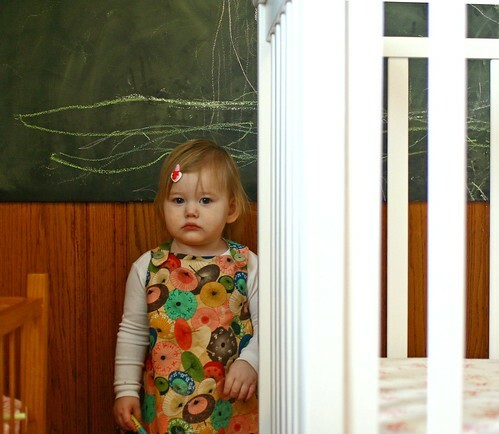 Your daughter's room is adorable--both with the wallpaper and now with the chalkboard. I am soon planning to paint an area of my son's wall in chalkboard paint. So fun! Your little girl is just precious. Thanks so much for visiting and commenting on my blog last week. How adorable are both iterations of the room. So fun. And, really, can you go wrong with a whole block of cheese? love both parts, you are so creative and that room is gorgeous. I love it! Definitely more fun for a big girl.I want my hubby to help me make a chalkboard in our kitchen. Her room is beautiful. Her dress is beautiful. And, of course, she is the most beautiful of all. P.S. Your soup sounds delicious! 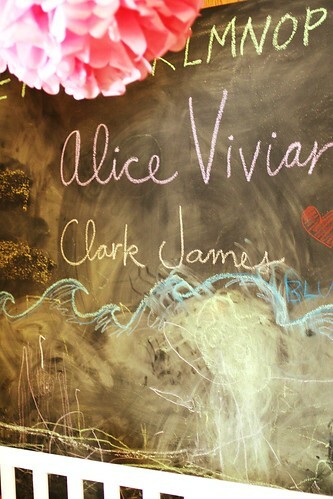 LOVE the chalkboard wall, it looks so cute!